NOTE: In the above, the angled, brown lines indicate the path of the first Emperors of Rome, which only parenthetically followed any father-son, rhyme or reason line of descent. It is also interesting to note the first Romans go back to the 8th century BCE... when their contemporaries might have included: Uzziah, Jothan, Ahaz, and Hezekiah (Kings of Judah), not to mention Sargon II of Assyria who was busy challenging, if not ending, Israel’s right to exist. Also, at the time, Sparta was conquering the Messenians, the Eastern Chou Dynasty in China was prepping for another 500 years or so of rule ...and finally the first dated performance of the Olympic Games in Greece was already in the record books. See a second version (in living color!) at Wikipedia. Gaius Julius Caesar III (ca. 140 BC–85 BC) was a Roman senator, supporter and brother-in-law of Gaius Marius. He was the brother of Sextus Julius Caesar III, consul in 91 BC. His father had seen to his education by one of the best orators of Rome, Marcus Antonius Gnipho. In his will, he left Caesar the bulk of his estate. Unfortunately, after Marius's faction had been defeated in the civil war of the 80s BCE, this inheritance was confiscated by the dictator Sulla. Easy come; easy go. Aurelia Cotta (120 BC-54 BCE) was the mother of dictator Gaius Julius Caesar IV [the one all of the history books call the Julius Caesar]. Her father was consul in 119 BCE and her paternal grandfather of the same name was consul in 144 BCE. The family of the Aurelii Cottae was prominent during the Roman Republican era. Her mother Rutilia, was a member of the gens Rutilius cognominated Rufus. They were of consular rank. Three of her half-brothers were consuls: Gaius Aurelius Cotta in 75 BCE, Marcus Aurelius Cotta in 74 BCE and Lucius Aurelius Cotta in 65 BCE. They were the sons of her mother, Rutilia's second marriage with her paternal uncle Gaius Aurelius Cotta. The historian Tacitus considers her an ideal Roman matron and thinks highly of her. Plutarch describes her as a "strict and respectable" woman. Highly intelligent, independent and renowned for her beauty and common sense, Aurelia was held in high regard throughout Rome. Aurelia and her family were very influential in her son’s upbringing and security. [The fact that he became Rome’s most notable Emperor/Dictator since Romulus, may be considered to speak volumes about Aurelia.] Her husband, the elder Gaius Caesar (III), was often away, so the task of raising their son fell mostly on Aurelia's shoulders. When the younger Caesar was about 18, he was ordered by the then dictator of Rome, Lucius Cornelius Sulla, to divorce his young wife Cornelia. Young Caesar firmly refused, and by so doing, put himself at great risk from Sulla. Aurelia became involved in the petition to save her son and along with her brother Gaius Cotta, defended young Caesar against the dictator. Gaius Julius Caesar IV [JULIUS CAESAR] was a Roman military and political leader. He played a critical role in the transformation of the Roman Republic into the Roman Empire. He didn’t do too badly for himself, either. And yet... perhaps his greatest failure was to actually find a spot in the family lineage leading to all of the really interesting people... like myself, for example. Even so, one can see certain family resemblances. After all... blood will tell. The problem, of course, was that Julius Caesar’s wives and children did not fare all that well... and thus his blood line pretty well expired with precious little to show for all of his troubles. Kids in those days were as unreliable as they are today! As a politician, Caesar made use of popularist tactics [albeit, tactics designed to attain popular support in ensuring a royalist, elitist, divinely ordained, exclusivity in the power and management of the affairs of the empire]. During the late 60s and into the 50s BCE, he formed political alliances that led to the so-called "First Triumvirate," an extra-legal arrangement with Marcus Licinius Crassus and Gnaeus Pompeius Magnus ("Pompey the Great"). This Tirumvirate was to dominate Roman politics for several years. Their factional attempts to amass power for themselves were opposed within the Roman Senate by the optimates, among them Marcus Porcius Cato and Marcus Calpurnius Bibulus, with the sometime support of Marcus Tullius Cicero. Caesar's conquest of Gaul extended the Roman world to the North Sea, and in 55 BCE he also conducted the first Roman invasion of Britain. These achievements granted him unmatched military power and threatened to eclipse Pompey's exalted status, while the death of Crassus contributed to increasing political tensions between the two triumviral survivors. Political realignments in Rome finally led to a stand-off between Caesar and Pompey, the latter having taken up the cause of the Senate... in full accordance with the age old adage that the enemies of my enemy are my friends. With the order that sent his legions across the Rubicon, Caesar began a civil war in 49 BCE from which he emerged as the unrivaled leader of the Roman world. The Battle of Carrhae, fought in 53 BCE near the town of Carrhae, was a major battle between the Parthian Empire and the Roman Republic. Parthia's Spahbod Surena decisively crushed a Roman invasion force led by Marcus Licinius Crassus. It was the first of many battles between the Roman and Persian empires, and one of the most crushing defeats in Roman history. Crassus, a member of the First Triumvirate and the wealthiest man in Rome, had been enticed by the prospect of military glory and riches and decided to invade Parthia without the official consent of the Senate. Rejecting an offer from the Armenian King Artavasdes II to invade Parthia via Armenia, Crassus marched his army directly through the deserts of Mesopotamia. [Generals who march armies across deserts... all too often justly get their... deserts.] His army clashed with Surena's force near the town of Carrhae, present day Harran. Despite being heavily outnumbered, Surena's cavalry completely outmaneuvered the Roman heavy infantry, killing or capturing most of the Roman soldiers. Crassus himself was killed when truce negotiations turned violent. His death led to the end of the First Triumvirate and the resulting civil wars between Julius Caesar and Pompey. After assuming control of government, Caesar began extensive reforms of Roman society and government. He centralized the bureaucracy of the Republic and was eventually proclaimed "dictator in perpetuity" (dictator perpetuo). A group of senators, led by Marcus Junius Brutus, assassinated the dictator on the Ides of March (15 March) 44 BCE, hoping to restore the normal running of the Republic. However, the result was another Roman civil war, which ultimately led to the establishment of a permanent autocracy by Caesar's adopted heir, Gaius Octavianus. In 42 BCE, two years after his assassination, the Senate officially sanctified Caesar as one of the Roman deities. Considering that his great, great, great, great, great, great, great grandfather was Mars, this might actually make complete sense. The elder of the two sisters of Julius Caesar is only known from a passage in which Suetonius mentions her two grandsons, Lucius Pinarius and Quintus Pedius. [These roman names are... well... classic!] If the two men were actually her sons, as has been conjectured, she was married, in what order is uncertain, to a Pinarius, of a very ancient patrician family, and a Pedius. [She may also have had an ill-fated affair with a bard named Boronius Tedius.] It is not known which of the Julias gave evidence against Publius Clodius Pulcher, when he was impeached for impiety in 61 BCE. Nothing else is known about the life of the elder sister. •	Atia Balba Prima - mother of Quintus Pedius who served as a general and consul. “Julia” and her mother, Aurelia, had given the court a detailed and [allegedly] truthful account about the affair between Pompeia (her sister-in-law) and politician Publius Clodius Pulcher -- clearly a classic name for a politician. Nevertheless, Caesar divorced Pompeia over the scandal, citing such nonsense as his wife needing to be above suspicion... but not necessarily he himself being above suspicion... or, for that matter, being above most anything else. Balbus died in 52 BCE and Julia died a year later. At her funeral, Julia’s youngest grandson and grandchild (age 12 and then known as Octavian, the future Emperor Augustus) delivered an oration to her honor. Marcus Atius Balbus (105 BC–51 BC) was the son and heir of an elder Marcus Atius Balbus (148–87 BCE) and Pompeia. Pompeia was a sister to consul Gnaeus Pompeius Strabo, father of triumvir Pompey. The family of the elder Balbus came from a Roman senatorial family plebs status from Aricia (modern Ariccia, Italy). The younger Balbus was born and raised in Aricia. Atia Balba Caesonia (85-43 BCE) was a Roman noblewoman. She was the daughter of Julius Caesar's sister Julia Caesaris Minor. The name Atia Balba was also borne by the other two daughters of Julia Caesaris Minor and her husband praetor Marcus Atius Balbus. They were Atia’s older sister Atia Balba Prima and younger sister Atia Balba Tertia. Gaius Octavius (circa 100-59 BCE) was descended from an old, wealthy equestrian branch [*] of the Octavii family. Despite being from a wealthy family, his family was plebeian, rather than patrician... and this was in a Rome where class counted. He may have been attracted to his second wife, Atia Balba Caesonia... in that he pretty much had her number. Otherwise, how he and Atia met is not known, although Atia's family (through her father, the Balbi) lived close to Velitrae, which was the home base of the Octavii. Gaius Octavius Thurinus (later known as Augustus). [*] Equestrian was the lower of the two aristocratic classes of ancient Rome, ranking below the patricians (patricii), an hereditary caste that monopolized political power during the regal era (to 501 BCE) and during the early Republic (to 338 BCE). A member of the order was equivalent to being a "knight": [Have horse, will travel... and fight... and travel and fight some more... and on and on and on...] Actually, the motto is: [“Have “a composite bronze cuirass, Attic-style helmet with horsehair plume, pteruges, and mantle... (as well as) a spear and small round shield.”] In Latin, Carpe Jugulum . In short, a legendary, legionary cavalry man. It should be noted that as a novus homo ("new man"), Gaius was not of a senatorial family. [No one wants a senator to smells like a stable.] Nevertheless, his great-great-grandfather Gaius Octavius fought as a military Tribune in Sicily during the Second Punic War. His father Gaius Octavius was a municipal magistrate who lived to an advanced age. He was distantly related to Gnaeus Octavius, the consul of 87 BC who led the opposition to Lucius Cornelius Cinna. It all helped in his career. Octavius was elected quaestor in 70 BCE. In 61 BCE, he was elected praetor. In 60 BCE, after his term had ended, he was appointed propraetor, and was to serve as governor of Macedonia. Before he left for Macedonia, the senate sent him to put down a slave rebellion at Thurii. These slaves had previously taken part in the rebellions of Spartacus and Catiline. [I am Spartacus! ...but I ain’t never heard of no cat named Catiline.] His victory at Thurii may have resulted in his son, Augustus, receiving the agnomen Thurinus. He then left for Macedonia and proved a capable administrator, governing "courageously and justly". His deeds included leading the Roman forces to victory in an unexpected battle against the Thracian Bessian tribe. Cicero had high regard for his diplomatic dealings. Because of his successful term as governor of Macedonia, he won the support necessary to be elected consul. In 59 BCE, Octavius sailed to Rome, to stand for election as consul. However, he died before arriving in Rome. He supposedly died in the same bedroom where Augustus would pass away many years later. Octavia Minor (69 - 11 BCE), also known as Octavia the Younger or simply OCTAVIA, was the only daughter born of Gaius Octavius' second marriage to Atia Balba Caesonia, niece of Julius Caesar. Octavia was born in Nola, Italy; her father, a Roman governor and senator, died in 59 BCE from natural causes. Her mother later remarried, to the consul Lucius Marcius Philippus. Octavia spent much of her childhood traveling with her parents. She was the sister of the first Roman Emperor, Augustus (known also as Octavian), and half sister of Octavia Major. One of the most prominent women in Roman history, Octavia was respected and admired by her contemporaries for her loyalty, nobility and humanity, and for maintaining traditional Roman feminine virtues. Octavia’s first husband, Marcellus, was a man of consular rank, a man with a rank worthy of her -- he was consul in 50 BCE. He was also a member of the influential Claudian family and descended from Marcus Claudius Marcellus, a famous general in the Second Punic War. In 54 BCE, her great uncle Caesar was anxious for her to divorce her husband so that she could marry Pompey... the latter who had just lost his wife Julia (Julius Caesar's daughter and thus Octavia's cousin once removed). However, Pompey apparently declined the proposal. Because of this Marcellus continued to oppose Julius Caesar including the crucial year of his consulship 50 BCE. Marcellus, a friend of Cicero, was an initial opponent of Julius Caesar when Caesar invaded Italy, but did not take up arms against his wife's great uncle at the Battle of Pharsalus, and was accordingly eventually pardoned by him. In 47 BCE Marcellus was able to intercede with Caesar for his cousin and namesake, also a former consul, then living in exile. Presumably, Octavia continued to live with her husband from the time of their marriage (she would have been about 15 when they married) to her husband's death when she was about 29. All three were born in Italy. Marcellus died in May 40 BCE. After Marcellus’ death, and by a Senatorial decree, Octavia married Mark Antony (October 40 BCE). Octavia was his fourth wife (his third wife Fulvia having died shortly before). The marriage had to be approved by the Senate as she was pregnant with her first husband's child and, furthermore, this was a political marriage to cement the uneasy alliance between her brother, Octavian (Augustus) and Mark Antony. Despite everything, however, Octavia appears to have been a loyal and faithful wife to Antony. Between 40 BCE and 36 BCE, Octavia lived with him in his Athenian mansion. She raised her children by Marcellus; Antony's two sons by previous marriages, and their two daughters: Antonia Major and Antonia Minor, who were born there. Augustus had adopted Octavia’s son Marcellus as his heir, but Marcellus died of illness in 23 BCE. Octavia had opened the Library of Marcellus in his memory, while her brother completed Marcellus's theatre for similar reasons. She never fully recovered from the death of her son and retired from public life, spending her final years dressed in mourning. Octavia died between 11 and 9 BCE. She was still alive when her niece Julia the Elder married Tiberius (aka the TIBERIUS, Rome’s Emperor following the AUGUSTUS, and preceding the CALIGULA). Her funeral was a public one, with her sons-in-law carrying her to the grave. She was buried in the Mausoleum of Augustus. Augustus delivered the funeral oration and gave her the highest posthumous honors (e.g. building the Gate of Octavia and Porticus Octaviae in her memory). Augustus declined some other honors decreed to her by the senate, for reasons unknown. She was one of the first Roman women to have coins minted in her image. Marcus Antonius (Mark Antony) (January 14, 83 -- August 1, 30 BCE), was a Roman politician and general. [In general... it can be said that such was an essential combination in Roman... and other times.] He was an important supporter and the loyal friend of Gaius Julius Caesar, both as a military commander and as an administrator. It helped that he was Caesar's second cousin, once removed, by his mother Julia Antonia. After Caesar's assassination, Antony formed an official political alliance with Octavian (Augustus), and Marcus Aemilius Lepidus, known to historians today as the Second Triumvirate. The triumvirate broke up in 33 BCE... partly because no one seemed to even be aware of Lepidus’ status... and thus, not surprisingly, Lepidus was pissed. Things then only got worse, in 31 BCE, when a disagreement between Octavian and Antony erupted into civil war, what has been described as the Final War of the Roman Republic. Antony was defeated by Octavian at the naval Battle of Actium, and in a brief land battle at Alexandria. Antony and his lover Cleopatra committed suicide shortly thereafter. A member of the Antonia gens, Antony was born in the winter of 87-6 BC, probably when Sulla's army was besieging Athens during the Mithridates War. His father and namesake, Marcus Antonius Creticus, was the son of the great rhetorician Marcus Antonius Orator who had been murdered and decapitated by order of Gaius Marius at the end of 87 BCE. His mother Julia was a daughter of Lucius Caesar (consul 90 BCE, censor 89 BCE), another Marian victim slain with Antonius Orator. His father (praetor 74 BCE) died in 71 BCE, during his command against Mediterranean piracy. Julia was soon remarried to Publius Cornelius Lentulus (Sura) (consul 71 BCE), an eminent patrician politician and co-leader of the infamous Conspiracy of Catiline named after the latter... but apparently no one was related to Spartacus... at least no family relationship. Gaius Julius Caesar OCTAVIANUS Thurinus AUGUSTUS (23 September 63 BCE – 19 August 14 CE) was the first emperor of the Roman Empire, which he ruled alone from 31 BCE until his death. Born Gaius Octavius Thurinus, he was adopted by his great-uncle Gaius Julius Caesar in 44 BCE. Between then and 31 BCE, he was officially named Gaius Julius Caesar. He picked up the Thurinus moniker from his father, and then in 27 BCE the Senate awarded him the honorific Augustus ("the revered one"). Accordingly, he became Gaius Julius Caesar (Thurinus) Augustus. Because of the various names he bore, it is common to call him Octavius when referring to events between 63 and 44 BCE, Octavian (or Octavianus) when referring to events between 44 and 27 BCE, Augustus when referring to events between 27 BCE and 14 CE, and Augustus Gone Bye-Bye when referring to events after CE 14. Gaius Caesar (adoptive), oldest son of Marcus Vipsanius Agrippa and Julia the Elder. Lucius Caesar (adoptive), second son of Marcus Vipsanius Agrippa and Julia the Elder. Augustus's only natural child was his daughter, Julia the Elder. Despite the large number of his descendants, the line was apparently extinct less than a hundred and seventy years after his death. Obviously, there was a LOT of sibling and cousin rivalry! To really appreciate this radical pruning of a family tree, Wikipedia has plotted it all out in such a manner as to make the day of every organizational chart aficionado. Check it out (under Descendants)! The young Octavius came into his inheritance after Caesar's assassination in 44 BCE. In 43 BCE, Octavian, equipped with the first of his name changes, joined forces with Mark Antony and Marcus Aemilius Lepidus in a military dictatorship known as the Second Triumvirate. As a triumvir, Octavian ruled Rome and many of its provinces as an autocrat, seizing consular power after the deaths of the consuls Hirtius and Pansa and having himself perpetually re-elected. The triumvirate was eventually torn apart under the competing ambitions of its rulers: Lepidus was driven into exile, and Antony committed suicide following his defeat at the Battle of Actium by the fleet of Octavian commanded by Agrippa in 31 BCE. After the demise of the Second Triumvirate, Octavian restored the outward facade of the Roman Republic, with governmental power vested in the Roman Senate. In practice, of course, he retained his autocratic power, even if it took several years to determine the exact framework by which a formally republican state could be led by a sole ruler... but sigh, where’s there’s a political will, there’s a way. The result became known as the Roman Empire. This emperorship was never an office like the Roman dictatorship which Caesar and Sulla had held before him. For one thing, the spelling was different... including, as previously mentioned, “Augustus” in lieu of “Octavian”. Augustus in fact declined the honor when the Roman populace "entreated him to take on the dictatorship". Yeah, right. Instead, Augustus, by law, held a collection of powers granted to him for life by the Senate, including those of tribune of the plebs and censor. (Sounds curiously like a dictatorship.) He was consul until 23 BCE. His substantive power stemmed from financial success and resources gained in conquest, the building of patronage relationships throughout the Empire, the loyalty of many military soldiers and veterans, the authority of the many honors granted by the Senate, and the respect of the people. Hey! If it works; don’t fix it!. Augustus' control over the majority of Rome's legions established an armed threat that could be used against the Senate, allowing him to coerce any of the Senate's decisions... like naming him ‘Augustus’. With his ability to eliminate senatorial opposition by means of arms, the Senate became utterly docile towards his paramount position. His rule through patronage, military power, and accumulation of the offices of the defunct Republic became the model for all later imperial governments. The rule of Augustus did, in fact, initiate an era of relative peace known as the Pax Romana, or Roman peace. Despite continuous frontier wars, and one year-long civil war over the imperial succession, the Mediterranean world remained at peace for more than two centuries. Augustus expanded the Roman Empire, secured its boundaries with client states, and made peace with Parthia through diplomacy. He reformed the Roman system of taxation, developed networks of roads with an official courier system, established a standing army (and a small navy), established the Praetorian Guard, and created official police and fire-fighting forces for Rome. Much of the city was rebuilt under Augustus; and he wrote a record of his own accomplishments, known as the Res Gestae Divi Augusti, which has survived. Upon his death in 14 CE, Augustus was declared a god by the Senate, to be worshipped by the Romans. His names Augustus and Caesar were adopted by every subsequent emperor, and the month of Sextilis officially became August. Livia Drusilla (after 14 CE called Julia Augusta) (58 BCE-29 CE) was a Roman empress as the third wife of the Emperor Augustus and one of the most powerful women in the Roman Empire, being Augustus' faithful advisor. She was also mother to Drusus (the Elder) and Tiberius, as well as the grandmother to Germanicus and Claudius, great-grandmother to Caligula and Agrippina the Younger and great-great-grandmother to Nero. She was deified by Claudius who acknowledged her title of Augusta. When a general amnesty was announced, and Livia returned to Rome, she was personally introduced to Octavian in 39 BCE... in fact, introduced as the daughter and widow of men who had fought against Octavian. On top of everything else, Livia already had a son, Tiberius (a chip off the old block?). Even more noteworthy, she was pregnant with a second son, Nero Claudius Drusus (also to be known as Drusus the Elder). Legend (being something of a die-hard romantic) said that Octavian fell immediately in love with Livia... despite the (minor) facts that: 1) he was still married to Scribonia, 2) Livia was still married to Tiberius, and 3) Livia's lineage had been Octavian's enemies. One might notice a curious aspect of Roman Royal Power: Despite kings having multiple wives, concubines, and alternative amusements... by the time of Rome as an alleged Republic, the idea of only one marriage per male (at a time) had seemed to have taken control. Replacing the idea of having as many wives as a king/emperor might like, it was now a matter of a king/emperor having as many wives as he liked... but chronological, instead of simultaneous. The importance of the patrician Claudii to Octavian's cause, and the political survival of the Claudii Nerones are probably just a few of the more rational explanations for this tempestuous union. Nevertheless, Livia and Octavian clearly reached a rather unique understanding, and thereby remained married for the next 51 years... despite the fact that they had no children apart from a single miscarriage. Livia always enjoyed the status of privileged counselor to her husband, petitioning him on the behalf of others and influencing his policies, an unusual role for a Roman wife in a culture dominated by the paterfamilias, godfathers, and the like. After Mark Antony's suicide following the Battle of Actium in 31 BCE, Octavian had removed all obstacles to his power and henceforth ruled as Emperor, from 27 BCE on, under the honorary title Augustus. He and Livia formed the role model for Roman households. Despite their wealth and power, Augustus's family continued to live modestly in their house on the Palatine Hill. Livia actually set the pattern for the noble Roman matrona. She wore neither excessive jewelry nor pretentious costumes; she took care of the household and her husband (often making his clothes herself), and was always faithful, if not dedicated to him (and/or her status). In 35 BCE Octavian gave Livia the unprecedented honour to rule her own finances and dedicated a public statue to her. She had her own circle of clients and pushed many protégés into political offices, including the grandfathers of the later emperors Galba and Otho. Among her many titles (official) were Empress of Rome (her title and office eventually superceded by Livia Orestilla) and Empress-Mother of Rome (this title and office eventually superceded by Agrippina the Younger). Tiberius Claudius Nero I (c. 85 - 33 BCE) [NOT the emperor] was a member of the Claudian Family of ancient Rome. He was a descendant of the original Tiberius Claudius Nero, a consul and son of Appius Claudius Caecus the censor. His father Drusus Claudius Nero served under Pompey in 67 BCE, battling the pirate menace, and was famous for recommending that the members of the Catiline Conspiracy be confined. His mother was a descendant of the republican Claudian Family. He was the father of the Roman Emperor Tiberius (TIBERIUS) and Nero Claudius Drusus (the Elder), father-in-law to Antonia Major and Antonia Minor, grandfather to the Emperor Claudius (CLAUDIUS) Germanicus, and Livilla, great-grandfather to the Emperor Caligula [CALIGULA] and Empress Agrippina the Younger, and great-great-grandfather to the Emperor Nero [NERO]. In some respects, his name nearly says it all. Around this time, TCN I married his relative Livia Drusilla, whose father Marcus Livius Drusus Claudianus was from the same gens... another republican to boot [pardon the suggestion]. His son of the same name, aka TCN II, was born 16 November 42 BCE, at Fondi, Italy. Shortly afterwards, the second triumvirate began to break down (and despite any protests of innocence by the infant TCN II). This caused a very dangerous situation in Rome as the triumvirs went to battle with each other. Tiberius Nero (I) was forced to choose sides, and in his distrust of Octavian, he cast his lot with Mark Antony... the first of several bad choices. In 41 BCE, he fled Rome with Livia and Tiberius (II) in tow, joining Antony's brother Lucius in Perusia. Perusia was besieged by Octavian's men by the time Tiberius Nero arrived, and when the town fell in 40 BCE, he was forced to flee first to Praeneste, and then to Naples. In Naples, Tiberius Nero tried in vain to raise a slave battalion against Octavian, and then took refuge with Sextus Pompey, who was then acting as a pirate leader in Sicily. Nero and family joined Mark Antony soon after in Achaea. In 40 BCE, Octavian and Mark Antony finally reconciled. After 3 years of fleeing from Octavian, Tiberius Nero returned to Rome with his wife and the younger Tiberius, aged 3. When Livia was six months pregnant, Tiberius was persuaded or forced by Octavian to divorce Livia. On 14 January the child was born, and was named Decimus Claudius Drusus, which was later changed to Nero Claudius Drusus [aka Drusus the Elder]. Octavian and Livia got married on 17 January. The wedding, itself, came to be known as a “sword wedding”... a precursor to the modern “shotgun weddings”, with its extra, added dramatic appeal to the attending celebrants. Antonia Minor, also known as Antonia the Younger or simply Antonia (31 January 36 BCE-September/October 37 CE) was a daughter of Roman politician Mark Antony and Octavia Minor (the latter from whom she inherited the more impressive lineage). She was the younger niece of the Emperor Augustus, sister-in-law to the Emperor Tiberius, paternal grandmother of the Emperor Caligula, mother of the Emperor Claudius, and maternal great-grandmother of the Emperor Nero. Antonia was one of the most prominent Roman women. She was celebrated for her virtue and beauty. She was the favorite niece of Rome’s first Emperor Augustus. Germanicus was very popular among the citizens of Rome, who enthusiastically celebrated all his victories. [Everyone... accept perhaps the losers... loves to celebrate a winner.] He was also a favorite with Augustus, his grandfather-in-law, who, for a period of time, considered him as heir to the Empire. Germanicus was married to Agrippina the Elder, daughter of Marcus Vipsanius Agrippa and Julia the Elder (Augustus's only daughter). He had nine children by Agrippina but, alas, only six lived to adulthood. The survivors were (from oldest to youngest) Nero Caesar, Drusus Caesar, Caligula, Agrippina the Younger, Julia Drusilla and Julia Livilla. In 4 CE, Augustus finally decided in favor of Tiberius, his stepson, but he had apparently preferred to adopt Germanicus as a son and name him his heir. After the death of Augustus in 14 CE, the Senate appointed Germanicus commander of the forces in Germania. Tiberius was made emperor, but he was highly unpopular and the legions rioted on the news. Refusing to accept Tiberius, the rebel soldiers cried for Germanicus as emperor. However, Germanicus refused. Germanicus died in Antioch, Syria in 19 CE, a year after he defeated the kingdoms of Cappadocia and Commagene. His death was surrounded by speculation that he may have been poisoned by Gnaeus Calpurnius Piso, governor of Syria, under the orders of the emperor Tiberius, who would obviously be acting as a less than ideal guardian under the circumstances. After Livilla's death, Antonia's only remaining child was Claudius. Due to his demonstrated illnesses and/or physical disabilities, she would constantly put him down. [But, not literally.] She would say a monster: a man whom nature had not finished but had merely begun or, when accusing anyone of stupidity, would exclaim, he is a bigger fool even than my son Claudius!. She may have done her duty in raising Claudius, but she never loved him. When Emperor Tiberius died, Caligula became emperor in March 37 CE. The new emperor awarded Antonia a senatorial decree, granting her all the honors Livia Drusilla had received in her lifetime. She was also offered the title of Augusta, previously only given to Augustus's wife Livia, but rejected it. Six months into his reign, Caligula became seriously ill and never completely recovered, (albeit according to some sources, the illness was feigned). Antonia would often offer Caligula advice, but he once told her, I can treat anyone exactly as I please! Caligula was rumored to have had his young cousin Gemellus beheaded, to remove him as a rival to the throne. This act was said to have outraged Antonia, who was grandmother to Gemellus as well as to Caligula. Having had enough of Caligula’s anger at her criticisms and of his behavior, she committed suicide. But then... Suetonius’s Caligula, clause 23, mentions how Caligula might have poisoned her. When Claudius became emperor after his nephew’s assassination in 41 CE, he gave his mother the title of Augusta. Her birthday became a public holiday, which had yearly games and public sacrifices held. An image of her was paraded in a carriage. 2. Decimus Claudius Drusus, aka Nero Claudius Drusus Germanicus, aka Drusus the Elder... et al  Tiberius Nero I (=Livia Drusilla Augusta)  Drusus Claudius Nero  ... Consul Tiberius Claudius Nero [?] Appius Claudius Caecus [?] ... republicans! Nero Claudius Drusus Germanicus (14 January 38 BCE - 14 September 9 BCE), born Decimus Claudius Drusus, but later called Drusus, Drusus I, Nero Drusus, Drusus the Elder, and perhaps, Drusus the Bewildered... not to mention... Drusus the Multiple Personality; was a Roman politician and military commander. He was a patrician Claudian on his father's side but his mother came from the Livii Drusi, a plebeian family... making him something of a half-caste. He was the stepson of the Emperor Augustus, brother of the Emperor Tiberius, paternal grandfather of the Emperor Caligula, father of the Emperor Claudius, and maternal great-grandfather of the Emperor Nero. Drusus was the youngest son of Roman Empress Livia Drusilla from her marriage to Tiberius Nero (I). Drusus was born shortly before Livia divorced Tiberius Nero and married Augustus (17 January, 38 BCE), giving rise to rumors that Augustus was the real father... despite the difficulty faced by the fact that Augustus had not yet met Livia when Drusus would have had to have been conceived. Also... before Augustus married Livia, Tiberius Claudius Nero I was declared Drusus' biological father. According to Suetonius, Drusus was born with the praenomen Decimus, but it was later changed to Nero. He was raised in Claudius Nero's house with his brother, the future emperor Tiberius, until his father's death. Drusus and his brother Tiberius developed a famously close relationship in this environment that would last the rest of their lives. Tiberius named his eldest son after his brother (a departure from Roman naming convention), and Drusus did likewise. 3. TIBERIUS Claudius Nero II  Tiberius Claudius Nero I  Drusus Claudius Nero  ... Consul Tiberius Claudius Nero [?] Appius Claudius Caecus [?] ... republicans! TIBERIUS Julius Caesar Augustus, born Tiberius Claudius Nero, Tiberius Julius Caesar (from adoption to accession) (November 16, 42 BCE – March 16, 37 CE), was the second Roman Emperor, following the death of Octavian Augustus in 14 CE, and continuing until his own death. There is the distinct possibility that when hints of Augustus changing his will (including his choice of an heir) reached her ears, Livia poisoned her husband Augustus, in order that her son, Tiberius, would become emperor. Tiberius was by birth, a Claudian, son of Tiberius Claudius Nero I and Livia Drusilla. His mother divorced his natural father and was married to Augustus in 39 BCE, making Tiberius a step-son of Octavian. Tiberius would later marry Augustus' daughter Julia the Elder (from his marriage to Scribonia) and from this, be later adopted by Augustus. This act by Augustus meant that Tiberius could officially became a Julian, and thus allowed to bear the name Tiberius Julius Caesar. 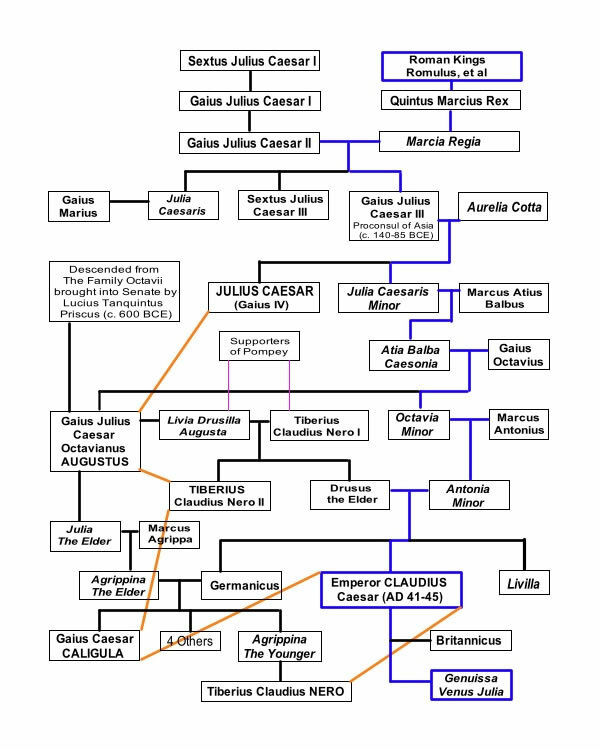 The subsequent emperors after Tiberius would continue this blended dynasty of both families for the next forty years... with historians naming it the Julio-Claudian dynasty. In relations to the other Roman Emperors of this dynasty, Tiberius was the stepson of the Emperor Augustus, great-uncle of the Emperor Caligula, paternal uncle of the Emperor Claudius, and great-great uncle of the Emperor Nero. Tiberius was one of Ancient Rome's greatest generals, whose campaigns in Pannonia, Illyricum, Rhaetia and Germania laid the foundations for the northern frontier. Sadly, he came to be remembered by history as a dark, reclusive, and somber ruler who never really desired to be emperor. For example, Pliny the Elder called him tristissimus hominum, "the gloomiest of men." After the death of Tiberius’ son Drusus Julius Caesar in 23 CE, the quality of Tiberius’ rule declined and ultimately ended in a raving terror. In 26 CE, Tiberius exiled himself from Rome and left the administration on the Empire largely in the hands of his unscrupulous Praetorian Prefects Lucius Aelius Sejanus and Quintus Naevius Sutorius Macro. Sejanus was eventually beheaded on Tiberius’ order (for plotting regicide, as opposed to poor administrative skills). Caligula, Tiberius’ adopted grandson, succeeded the Emperor upon his death. Also Carpe Jugulum, Terry Pratchett, Harper, New York, 2008.